Category Archives: The Explanatory Ones. Posted by tvdraco in Draco-ings, Games, The Explanatory Ones. These are trying times. They’re actually pretty ok but after Transistor Draco likes saying that. As for news Draco will have to post photos for photo class on Tumblr. As you already possibly know Draco loves taking photos so this is pretty great. Individual photos will be posted on Tumblr and groups of Photos will be posted on both. That’s pretty exciting. Sadly for you it will be “assignments” and not any old cool photo Draco takes but maybe some of those will slip in if we have time. On a positive note, look how cute this is. This is a super cute character from a super cute new game called Lonely Wolf Treat . Available Now!!!!!!! But really Tiff is such a great plush-artist too. Check out both. Her name is Treat. It’s not some weird story about the only wolf treat in a box formerly full of wolf treats. Well it kinda is. It’s about a wolf in a town full of rabbits so if you wanna take it that way you could. You would probably be the weird one at that point but we still love you. As for taking you can take this game home for the price range of free-$12 million+. So go pick it up. It has wolves and wolves are cool. Also pick up Syrup and The Ultimate Sweet, another game by this talented game maker which has more endings than most big budget choice based games combined. Also candy. It has candy. 10/10 great game. Posted by tvdraco in Draco-ings, The Explanatory Ones. We’ve entered our second year of Dracoblag and to start things off we will summarize for you, the reader, all the important things that happened last time(based on statistics and opinion). The most important topic on Dracoblag that you need to know about is Home page/ Archives. While it is not an actual topic and the statistic tells nothing of what people are looking at it is still really popular. It is so popular Draco could just cut everything else out and still have around 80% of the readership. 1.in the next seat we have the God’s Not Dead commercial review. This post really does encapsulate the spirit of Dracoblag for sure. We took apart this movie with fact and with common sense in a completely unbiased fashion. It’s clear why this was the most popular post(No it’s not, there were way better posts but oh well that is the power of star power). 2. The first bit of Dracoblag was that we never mentioned Felicia Day once. It was a time when all of the internet would occasionally mention her somewhere. Not Dracoblag though we stuck to other topics and made it an entire year without even having her name in a single post. This is a tradition we will carry well into the future. Remember you will never see the name Felicia Day even once on Dracoblag. That’s a fact. 3. When Draco realized Microsoft was the real life Abstergo from Assassin’s Creed based on their logo it was a scary time. There were guys in suits everywhere and a few ladies too. It was scary how few women were hired to intimidate Draco. Honestly there are millions of women who are well qualified to intimidate Draco with their toughness but they only hire old men from the Reagan era. It’s unfair. 4.Draco’s adventures in space will always be cherished by Draco and the maybe 6 people who read about them. Even more so now that Draco owns Outer Space. If one thing was to be learned it’s that Chicago has a large amount of beautiful lady people and Winter’s Tale is such a good movie it can keep you from dying. That was two things but odds are you didn’t even notice. Bet you didn’t notice the part where it explains you didn’t notice either. 6.Remember that time Draco wrote a review blog to avoid having to come up with a real post. Oh the laughs you and Draco had. It was splendid. That hilarious part where Draco realized this was getting long and reviews are the worst episodes of a show so it needed to end. Ya that was great. Posted by tvdraco in Draco-ings, Space 2014, The Explanatory Ones. So Draco has realized that two things on Dracoblag are popular. Cute Pictures and Complaining About Racism. Draco did that in all caps because it sounds like a possible title and Draco can do whatever Draco likes with anY of the LEtters Dracoooooo WaNts tooo. Sentences like that are some of Draco’s favorites. Now because pictures are popular and no one has been racist to Draco’s knowledge here, friends, is a picture of a blue cat samurai. 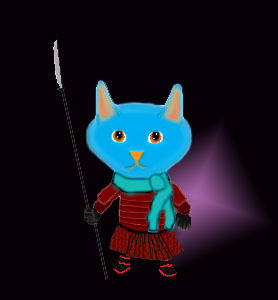 It’s blue, Draco’s favorite color, a cat, which the internet loves, and a samurai, which is cool. Also it is wearing the scarf Draco stupidly bought from the Space Station Draco stopped at before going all the way to whatever that new planet in space was. Totally not an airport in Chicago at all. So Draco listed a favorite color making this explanatory, Draco did the usual stuff so it gets the default category, and space was mentioned allowing the space category to be used. All three categories. This is the miracle post. Alert the Vatican because Draco is on the way to Sainthood. So on a note completely unrelated to airports Draco was never at and places Draco was never actually at, Draco was recently in Chicago so Draco can comment on Watch_Dogs. So people complained that they lowered the graphics quality and made Chicago look grey in game. Draco was in Chicago for probably 6 hours over several days. The only thing bad about the graphics in Watch_Dogs is they are far to colorful and realistic. From Draco’s time there Draco saw a flat grey city or no color at all. Admittedly there were 8 tornadoes on the way for one part but the other times it was still grey. Ubisoft did great. They made things pretty. A better complaint about the depiction of game cities would be with Infamous Second Son. They did Seattle but they did it better. Seattle is full of terrible hills; it is basically on a slant. There are hills everywhere and it is so annoying. If Draco could use magic Draco would just go around making cities like Seattle level like they did. Sure there might be environmental calamities and mass property damage but at least it would be easier to walk. Anyway it is not at all like real Seattle. You never hear that complaint but it’s the truth. One thing Draco didn’t mention in the first post was the reason for Blag instead of the more common blog. There is a very simple answer to this question though. According to the interwebs, a blag is like a blog, but involves bragging. Odds are this blog will contain much bragging and much complaining. Bragging will likely be atleast 40% of this blog. There will also likely be an oh this is cool, review of some thing, and maybe a cute picture component. Either way bragging is a majority stock holder. On the sidetopic called Downton Abbey, Draco picked this theme for this blog because it reminded Draco of Downton Abbey. Downton Abbey is amazing and all blogs should aspire to be it even if that doesn’t make sense. The first post of Dracoblag. So we begin that awkward journey from the beginning of Literallynooneisreadingthis Town towards the ultimate goal of getting to Infinitereader City in order to fight the final boss, Lord Roarevilname. First Draco should explain a few things about what is going on. Draco, the person writing this, will only speak in 3rd person. Draco will most likely write at an erratic schedule. Draco writes about real life, fake life, news life, game life, and assorted other topics. Draco might get E.C from a class for this. As of Today Draco now has two blogs but Draco doesn’t feel like doing two introductions. Congrats wordpress peeps; You got it first.